This month’s shop tip will cover different styles of helmets, how to properly fit your helmet, and accessories that go well with helmets. General notes on bike helmets: All bike helmets meet the same minimum federal safety standards. They will deteriorate over time due to UV and sweat exposure. It’s good to replace your helmet if it’s dented/ cracked, ever taken a significant impact, or over 3 years old. It’s best to try a helmet on before you purchase it. Most places (Community Cycling Center included) will not take helmets on return. Once a helmet leaves the shop it can’t be sold again regardless of condition. You’ll see big variations in helmet prices because of a few factors: 1) Fancy helmets will meet the same standards with less material to save weight or improve air flow. 2) Some helmets will have fancy finishes to make them look fancy. and 3) Some helmet makers spend more money on marketing and packaging. We stock helmets in every available size, with prices ranging from $15-$65. 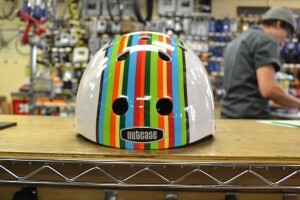 Traditional bike helmets: Most people are familiar with standard bike helmets. They cover mostly the top and front of the head, but don’t cover too much of the back of the head. They’re vented well enough that many will be cooler than a bare head. Most modern helmets have a dial in the back to fine tune the fit and keep the helmet in place. Some helmets come with a visor that usually does alright keeping sun out of your eyes, but does very little to keep rain off of eyeglasses. 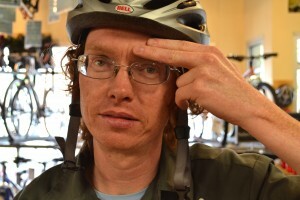 As an eyeglass wearer myself, I generally recommend a cycling cap under the helmet for the rainy season. We have traditional helmets starting at $15, with fancier helmets from Bell priced $35-65. Pros: Cooler (temperature wise) and lighter than multi-sport style helmets. Those with the dial are more comfortable, in my opinion. Cons: Not as durable as skate style. Some folks find them less stylish and ”too bikey” compared to multi-sport style helmets. Best use: The lighter weight makes them more comfortable for a racier, more stretched out riding position, but they’re great for any riding position. They’re not the best helmet to leave on the bike when you lock it up; I’ve come back to the racks to find a completely crushed helmet. Skate/multi-sport bike helmets: These helmets tend to have a rounder shape and cover more of the back of the head. They have fewer vents and are usually a little heavier and hotter than traditional bike helmets. I’ve heard complaints from people (especially smaller people) that the weight can bother one’s neck. Multi-sport helmets tend to have a thicker plastic covering the polystyrene foam, making them more durable against small impacts such as swinging into the bike rack as it hangs from your bag. 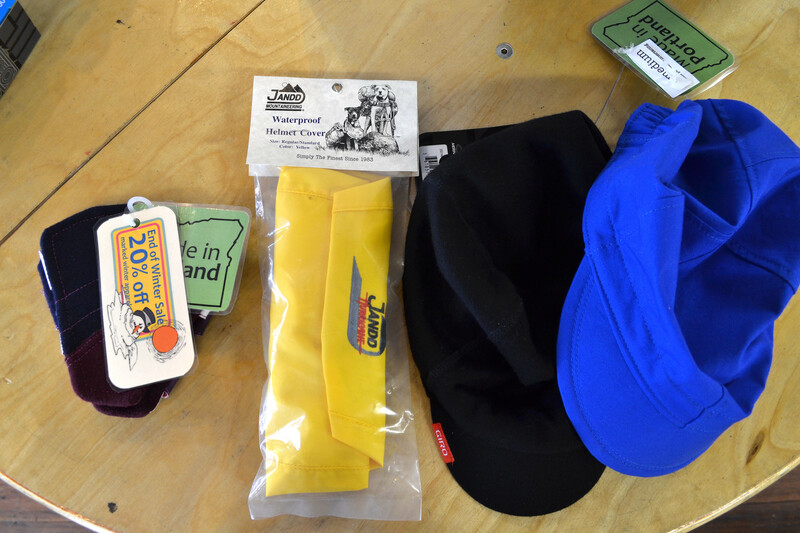 We have multi-sport helmets from Pryme starting at $30, and fancy Nutcase helmets (a Portland company) for $60. Pros: More durable against small hits, cover more of the head (this doesn’t necessarily make them safer), some find them more stylish. Cons: Hotter and heavier than a traditional cycling helmet. 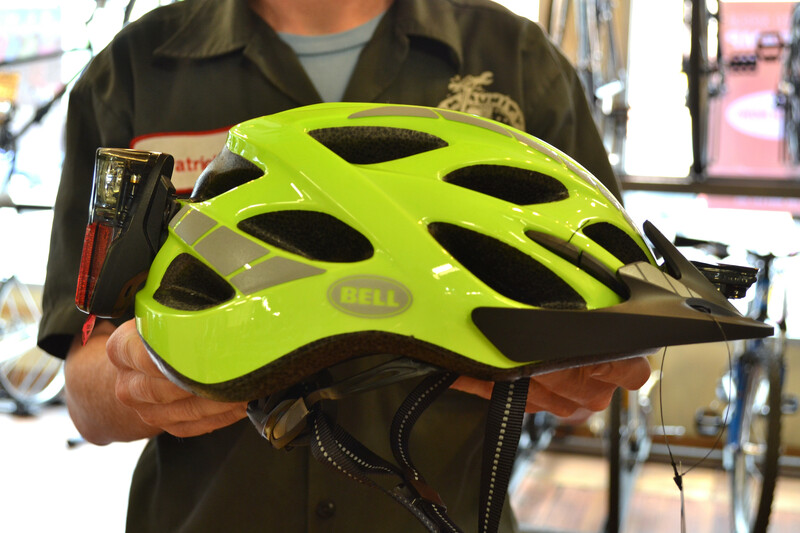 Best use: With the heavier weight, these helmets are more comfortable on a more upright, around town type of bike. The extra weight can cause neck strain on a really stretched out, race riding position. Helmet fit: Proper helmet fit is important for comfort and safety. You’re much more likely to wear your helmet and ride your bike if it’s comfortable. If a helmet fits properly, you will notice its presence fully around your head, but it won’t feel like it’s squeezing your head. If you helmet has a dial or some sort of adjustment in the back, start with the helmet loose and snug it up until you feel it wrap your head. If a helmet causes a headache it might be too small or heavy. I like to use the “two finger” reference when fitting a helmet. Two fingers above the eyebrow: You want two fingers between your eyebrows and the underside of the helmet. If a helmet sits higher on your forehead try rocking it forward. If that doesn’t work, it’s probably too small. Two fingers between the strap and ear: The helmet straps will form a ‘V’ around your ear. The valley of the ‘V’ should fall two fingers below your ear lobe so the strap doesn’t interfere with your ears. This part of the fit is based more on comfort than keeping the helmet in place, but again, the more comfortable the helmet the more likely you are to wear it. Two fingers between the strap and chin: The chin strap should be snug enough to hold the helmet in place, but shouldn’t choke you. The ideal tightness will let you fit two fingers between the strap and your chin, but no more. Most importantly, you shouldn’t be able to pull the strap over your chin. Accessories: Helmets are awesome because they protect your head. 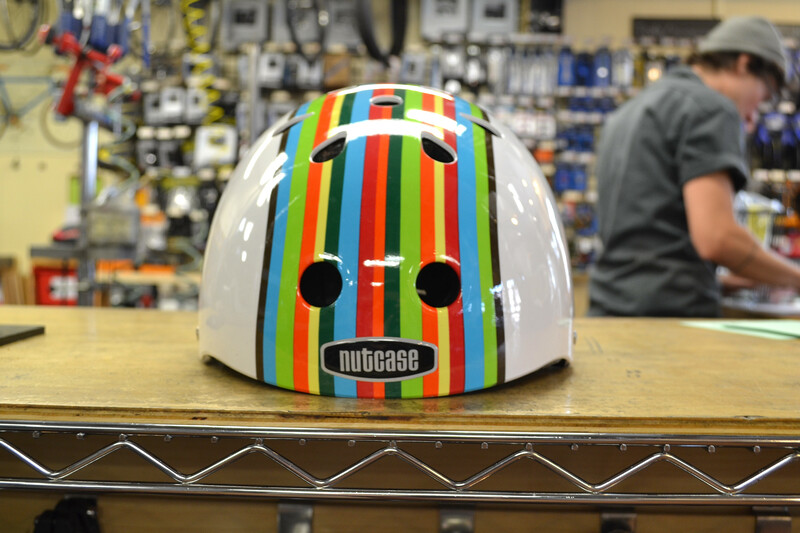 There are plenty of accessories out there to make your helmet even more awesome. Cycling Caps: My personal favorite. Cycling caps keep your head cool in the summer and warm in the winter. While not great, the brim on a cycling cap keeps more spots off eyeglasses than anything else I’ve found, and is great for sun shade. We stock summer and winter weight caps from Double Darn (made in Portland) ranging from $30 for a summer weight, to $42 for an ear flapped winter weight. Helmet covers: Best in winter, helmet covers are basically a rain jacket for your head. We carry Jandd covers for $18. 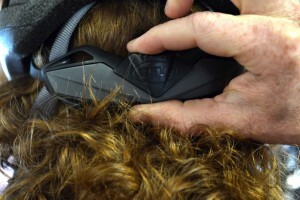 Helmet mounted ear flaps: Locally made, and recently reviewed, they attach to the ‘V’ part of the helmet straps to cover your ears and keep them warm. I find they’re more comfortable and regulate temperature better than an ear flapped cycling cap. Lights: If you forget to take your lights off the bike, but always bring your helmet in with you, mounting lights to your helmet is a great option. The Bell Muni helmet ($65) has built in mounts for lights. The visor has a mount for Blackburn Flea front lights ($55 for the front and rear set). The back of the helmet has a clip for any clip-on light. We have lots of rear light options that will work from $12-30. As you can see there are lots of options for helmets. 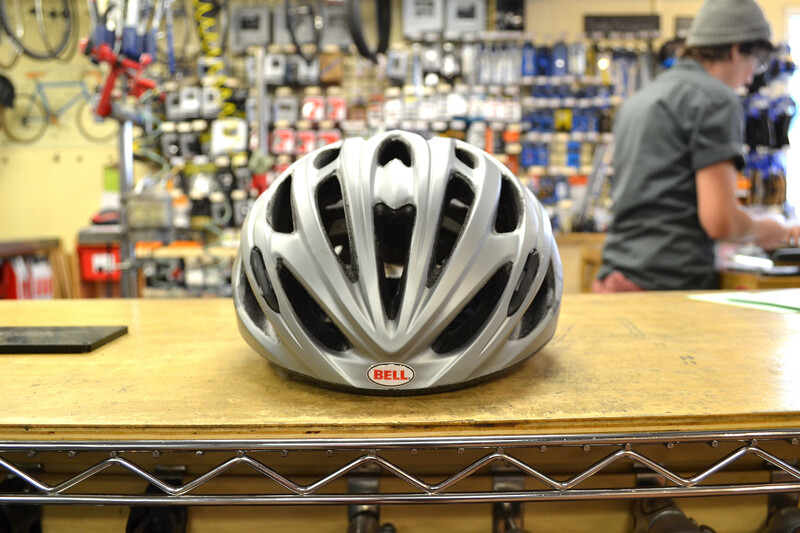 If you’re not sure what size or style suites you best or have a hard time getting your helmet comfortable on your head, come into the shop and speak to our friendly mechanics.